Salad lovers must be familiar with this crisp vegetable! Wait, is cucumber a vegetable or a fruit? Let's find the answer and learn more about Cucumbers! This classic summer food has high water content and naturally chilled internal temperatures. There are several benefits of it. Did you know that cucumbers can be one of your healthy snacks, as they are low in calories and carbohydrates and contain no fat. But some people experience side effects after eating cucumbers. Whether it’s itchy skin or embarrassing belching, pinning down what’s causing these unwelcome reactions will tell you whether you need to give up cucumbers, or simply look for new ways to enjoy the crunchy fruit. Cucumber (Cucumis sativus) is a widely cultivated plant in the gourd family, Cucurbitaceae. It is a creeping vine that bears cylindrical fruits that are used as culinary vegetables. The cucumber is originally from Southern Asia, but now grows on most continents. Many different varieties are traded on the global market. In North America, the term "wild cucumber" can refer to plants in the genera Echinocystis and Marah, but these are not closely related. Is Cucumber a vegetable or a fruit? To answer the question about "Is cucumber a fruit or a vegetable?" It is simple if you know the difference between Fruit and Vegetable. According to botanists (those who study plants) a fruit is the part of the plant that develops from a flower. It's also the section of the plant that contains the seeds. The other parts of plants are considered vegetables. These include the stems, leaves and roots — and even the flower bud. The following are technically fruits: avocado, beans, peapods, corn kernels, cucumbers, grains, nuts, olives peppers, pumpkin, squash, sunflower seeds and tomatoes. Vegetables include celery (stem), lettuce (leaves), cauliflower and broccoli (buds), and beets, carrots and potatoes (roots). Having an enclosed seed and developing from a flower, botanically speaking, cucumbers are classified as pepoes, a type of botanical berry. Much like tomatoes and squash they are often also perceived, prepared and eaten as vegetables. The human olfactory response to cucumbers appear to vary. What does cucumber taste like? Cucumber taste? Cucumber fruit tastes a mild, almost watery flavor or a light melon taste, while others sense a bitter taste with perfume qualities, attributable to the chemical compound, cucurbitacin. You've probably heard the saying "cool as a cucumber." This expression refers to someone's ability to remain calm, but it's also true that this green vegetable offers a cool, crisp taste. Cucumbers are part of the Cucurbit family, along with squash and melons. These plants naturally produce chemicals called cucurbitacins, which is very bitter and, in large quantities, can make a person ill. Most of the time, these chemicals are confined to the leaves and stem of the plant, but can work their way into the fruit of the plant in certain conditions causing bitter cucumbers. Cucumber Nutrients. Cucumbers are usually more than 90% water. Cucumbers also contribute vitamins A and C. Cucumber juice has significant amounts of potassium and is high in vitamin A. It also contains significant amounts of silicon, silica and sulfur. It also contains sterol. One half cup of sliced cucumbers contains 8.5 mcg vitamin K which is recognized as aid in blood clotting and the mineralization of bones. One 8.25 inch cucumber that weighs 301 grams, contains 10 carbohydrates; 2.4 g of fiber; 5 g of sugar ; 2 g of protein; and 0.3 g fat. + As cucumber is more than 90% water it is a great way to ensure you are meeting your body’s daily fluid needs for proper hydration which is important for healthy blood pressure and the elimination of normal metabolic wastes and environmental toxins. + Cucumbers naturally have 6 mg of sodium, whether they are peeled or not, but once they’ve been pickled, that sodium count goes through the roof because pickling is done in heavily salted brine. + An 8-inch cucumber provides 442 mg of potassium while a peeled cucumber has only 381 mg. Potassium is a mineral necessary for muscle contraction, especially of the heart muscle and regulates the heartbeat. It also causes the intestines to contract to release the stool. + One half cup of sliced cucumbers contain 1.5 mg of vitamin C. Vitamin C is a water-soluble vitamin that must be consumed daily and is essential for preventing atherosclerosis by protecting blood vessel walls from the harmful oxidizing effects of free radicals, proper wound healing and keeping your immune system healthy. + One half cup of sliced cucumbers contains 12 mg of phosphorus. Since they are low in phosphorus, according to MayoClinic.com, cucumbers may be part of your diet if you have kidney disease. + One half cup of sliced cucumbers provides 8 mg of calcium, 7 mg of magnesium, Calcium, magnesium and phosphorus are all essential for healthy bones, while calcium, magnesium and potassium maintain muscle contractions and a regular heart beat. + One half cup of sliced cucumbers provides trace amounts of the B vitamins, such as: 0.01 mg of thiamin, 0.02 mg of riboflavin, 0.02 mg of vitamin B-6 and 4 mcg of folate. These are necessary for energy. A large cucumber has 39 mcg folate. + One half cup of sliced cucumbers provides trace amounts of zinc, copper and manganese. Copper and manganese are trace minerals antioxidants, but copper is essential for iron metabolism, and manganese strengthens bones as well as regulates blood pressure. Zinc is part of the immune system and aids in healing. + One half cup of sliced cucumbers contains 18 mcg of beta-carotene, 43-55 IU of vitamin A. + One half cup of sliced cucumbers contains 8.5 mcg vitamin K which is recognized as aid in blood clotting and the mineralization of bones. + One half cup of sliced cucumbers contains 10 mcg of lutein which can help in protecting the eyes and in preventing age-related macular degeneration. + A large cucumber contains 2.4 g of dietary fiber, while a large peeled cucumber has 2 g.. Fiber bulk to foods, which satisfies hunger, slows the digestion of carbohydrates and helps regulate insulin. Dietary fiber may also prevent constipation and help to lower unhealthy LDL cholesterol levels. There are many potential health benefits of cucumber. Cucumber juice has been described as a well-known natural diuretic that may be beneficial as a blood cleanser, and beneficial for the large intestine, stomach and spleen. Cucumber contains "a hormone needed by the beta cells of the pancreas to create insulin." Russian herbalists have recommended its consumption to aid in the treatment of respiratory tract inflammation and to reduce lingering cough. It has also been suggested that it may be useful to soothe heartburn and reduce acid in the stomach. Cucumber juice is used as an ingredient in "many natural beauty creams and cosmetics." It has been used in the preparation of topical products such as soaps, shampoos, ointments, lotions, creams, essences, jellies, toilet water, perfumes, milk of cucumber, cucumber oil and glycerin of cucumber. Cucumber juice is commonly used topically as a skin rejuvenator and to improve skin complexion. It has been described as an effective treatment to reduce discomfort in rashes caused by exposure to poison oak and poison ivy, and as a means to reduce discomfort caused by sunburn, burns and scalds. It as also been described as having a "tonic and bleaching effect upon the skin" and as a treatment to remove blackheads, freckles and birthmarks. It has been described as containing a "strong proteolytic enzyme". Cucumber juice used in the eyes has been described as a means to reduce eye irritation, but as one not to be used for over one week. Cucumber juice has been described as a repellent against wood lice and fish-moths. Swelling or hives around your mouth, throat and tongue commonly occur with oral allergy syndrome. You may also experience itchy skin. If you have an allergy to ragweed, cucumbers may also cause allergic reactions, according to American Academy of Allergy Asthma & Immunology. A phenomenon known as cross-reactivity explains why some people with ragweed pollen also experience allergic symptoms after eating certain foods. Cucumbers fall into the ragweed cross-reactivity group, as do melons, sunflower seeds, chamomile tea and bananas. Cooking the foods usually removes the threat of allergic reactions. Traditional cucumbers contain a compound called cucurbitacin, which provokes indigestion in some people. Look for “burpless” varieties in the supermarket. If you grow your own, seek out seed catalogues offering burpless cucumber seeds. Breeders removed cucurbitacin from some varieties of cucumber, resulting in less gas and a less bitter taste. If your can’t find this variety of cucumber, or indigestion continues to be a problem, Drugs.com recommends vegetable or vegetable dishes with a “no gas” reputation, including winter squash, summer squash, carrots and vegetable soup. Other veggies that provoke gassiness in some people include cabbage, broccoli, cauliflower, radishes, green peppers, corn and onions. Some people wonder if the waxy finish found on supermarket cucumbers contains harmful chemicals. The artificial wax coatings replace the natural waxiness on certain vegetable skins, including cucumbers, that are often lost in the handling of field-to-market produce. The system helps cucumbers retain moisture and resist mold growth or bacterial disease in the shipping process. Wax coatings are food-grade and considered safe, according to the U.S. Food and Drug Administration. The waxes may be shellac, vegetable, beeswax or petroleum-based. If you have sensitivity to any of those products, cucumber skins could theoretically cause side effects. Scrub or peel the cucumbers before eating, or buy non-waxed cucumbers from farm stands or organic produce dealers. Cucumbers are traditionally served fresh, however, you may also cook it if you have allergic reactions. Cucumber is being used in several recipes. To prepare cucumber, rinse it with cool water right before using or consuming them. It can be eaten all alone, in fruit salads, or as a cucumber juice. The cucumber also adds crunch and coolness to green salads, pasta salads and tuna sandwiches. You can buy cucumbers year-round to add to salads. The vegetable is primarily water, with a mild flavor and crunchy texture. Cucumbers purchased in the supermarket usually come with a wax coating that helps prevent bruising, so you often peel them before eating. The peel can also be bitter and unpleasantly tough. Peeled cucumbers are not the most nutritious vegetable, but they do count toward your daily vegetable intake. Cucumbers add healthy bulk to salads or sandwich fillings. People on low-carb diets also appreciate cucumbers ability to stand in for starchy chips, crackers and breadsticks. Cut cucumbers into rounds to hold creamy cheese spreads and into spears for inclusion on a crudités platter. Whether you toss cucumber into a salad or serve it with a sandwich, cucumbers add taste and crunch to your meal. 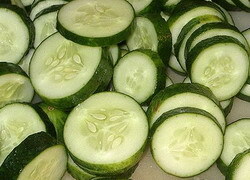 If you crave a simple, healthy snack, consuming 1/2 cup of cucumbers will barely raise your caloric intake for the day. After reading the whole article, now you have knowledge about cucumber, cucumber juice, side effects of eating cucumbers, the difference between a fruit and a veggie, cucumber recipes and many more. You might also want to learn more about other healthy fruit tomatoes, and healthy veggie broccoli. 0 comments on "Cucumber Fruit-Veggie as Natural Diuretic, Beneficial for the Large intestine, Stomach and Spleen"